I am not a multi project knitter. Unless there is an unexpected reason to stop one project and pick up an other, like an invitation to a baby shower, I like to finish one project before I start a new one. This can certainly work against me however. Because if I have an issue with it, an error I try to go back and fix and seem to only make worse, I may just put it down for an extended time which means no knitting at all. I’ll focus more on books instead. Doing this resulted in an entire year working on just my first sock. Not the pair – just the first sock. Maybe this is something I need to fix or maybe its just fine the way it is because I don’t seem to have the guilt that so many knitters do about having so many WIPs at one time. About a week ago I finished my last project. The Cable Me Not socks (Warm Tootsies), so I am currently in between WIPs. Because I am anticipating that spring will be here before to long (Please spring! Please be here before too much longer!) my next project may be my last for a while so I chose one that will very possibly extend into the warmer months. One that is outside my comfort zone even though it is considered an intermediate level pattern . The Dealla Cardigan by Cassie Castillo will be my first cardigan as well as my first attempt at using charts. I was drawn to the pattern immediately while looking at cardigans both for the pattern and the color chosen, I know color seems silly to be drawn to in a knitting pattern since it can so easily be changed, but this was a beautiful pattern and the perfect color. I have always wanted an Irish styled cardigan. I have Irish roots (my Older’s name was a surname on my mom’s side) and K is 100% Irish and first generation US born. Some of his older siblings were born in Belfast before his parents came to the US. His mom has a couple of hand knit wool cardigans that I absolutely love which has only deepened my desire to make one for myself. I purchased this pattern a few months ago and decided now it the time to start. But a very slow start. I need this to go as smoothly as possible since, as I’ve mentioned before, I’m not the most confident at going back to fix mistakes. I’ve ordered the yarn from Knit Picks, the exact same yarn used in the patter since it had called out to me from the start – Wool of the Andes Yarn in Pampas Heather, and am impatiently waiting for its arrival. But in the meantime I’ve got some practicing to do. I’ll be using some inexpensive worsted weight that I have laying around to practice reading the charts for the cable design. If I can do that okay I should be able to manage the medallion at the end. In preparation I stopped in an my local yarn shop, Gingerbread Antiques and Yarn, yesterday on my way home from work to get some No 7 US DPNs, have a look at their yarn selection and at the rest of the store. 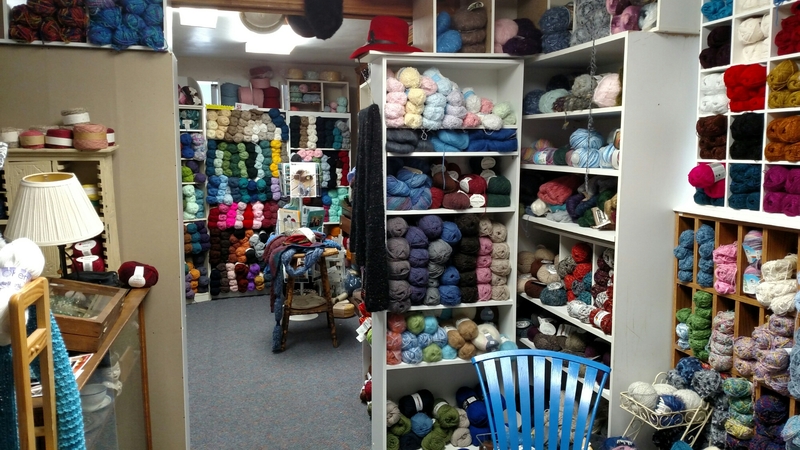 They do have a really great selection of quality yarns but none that called to me yesterday to take home. 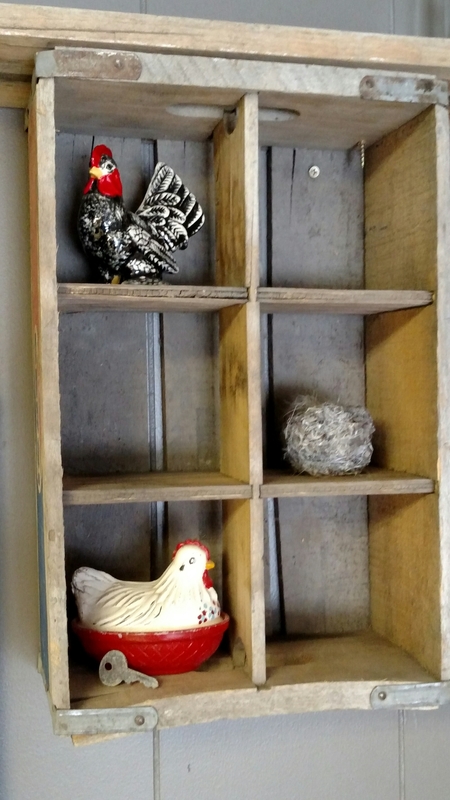 What did call to me was a small ceramic chicken that I immediately pictured in its new home, a section of the Pepsi shelf I had made last summer and housed another of my chicken collection. And I have to admit I was right. K even noticed it last night while we were sitting down to dinner. 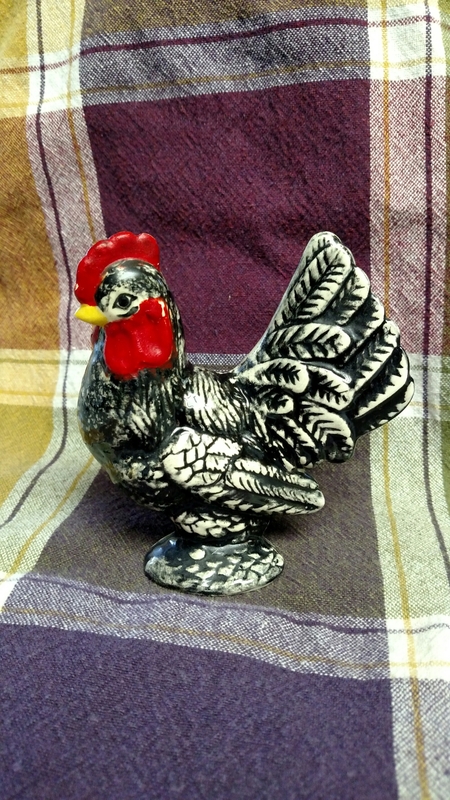 Little black hen found a new home. And perhaps it even brought me some luck! 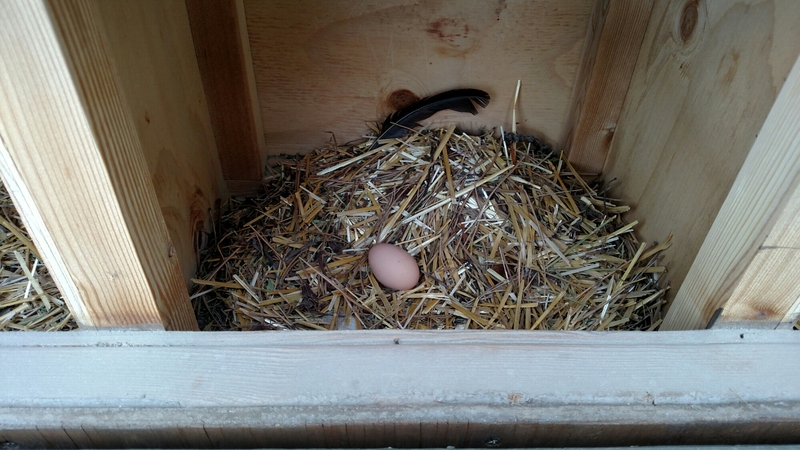 Because after I placed it on the shelf I went out back to feed my real chickens and lo and behold! An Egg! Short, cold days tend to mean fewer eggs. While my summertime average is 6 per day its been about 2 weeks since anyone has laid. Perhaps this means spring really is going to be here soon – despite the groundhogs prediction!